It's the first day of school, and the gang is lamenting the loss of their beloved Miss McGillicuddy. Their new teacher is Miss Crabtree, and the gang has all kinds of pranks in store for the old battleaxe. Jackie even brags about it to a nice young woman who gives him a ride to school. As it turns out, this nice young woman is Miss Crabtree herself. This short is a lot of fun. I enjoyed watching it even if it wasn't the "our Gang" I am personally used to. I am more used to the Alfalfa, Spanky & Darla time period. I believe this short is before that time period. But all the same it is a funny short. It has an actress by the name of June Marlowe (see pic above) as the new teacher. She certainly was a beautiful woman. I would have loved to of had a teacher that looked like that! Unfortunately the quality of this short left some to be desired. In parts the audio had a vibration to it... and the video left some to be desired. But I really can't complain about that considering this short is from 1930. Speaking of The Three Stooges, they've been coming out with them in re-mastered collections in which the shorts are being presented in the order they were originally released. I saw the latest volume in a store today for the first time...I believe this is the 6th volume and is the first to feature all shorts featuring Shemp. The 5th volume featured the final Curly shorts and the first Shemp shorts. I have the first 5 volumes but am unsure whether to get the Shemp ones...as with most guys, I'm a Curly afficianado. I need to watch all of the shorts in volume 5 before I decide whether to continue with the series. Regarding "Teacher's Pet", that's actually one of the Our Gang shorts I remember best. Jackie Cooper was in this one, right? You can't expect Alfalfa to be in every short...kids do grow up (though I believe this one was from before he joined up). Miss McGillicuddy? Wasn't that Lucille Ball's name in The Lucy Show? I will have to look into those Three Stooges sets. yeah... on the Little Rascals... that was one of the Jackie Cooper shorts. And of course I know the kids grow up. just that era of the show is what I was used to before now is all. But yeah I thought it was the pre-Alfalfa era. As for Miss McGillicuddy... I don't remember Lucy's characters name in The Lucy Show... it is very possible. But I do know it was Lucy's maiden name in I Love Lucy. That was the first thing I thought of when I heard Jackie say the name. Separated at birth, two unlikely twins (Arnold Schwarzenegger and Danny DeVito) set off on a road trip to locate their unsuspecting mother. What can I say? Danny DeVito and Arnold Schwarzenegger makes a great comedy team. I enjoyed this one even more then I did Junior. I think the whole idea of these two being twins is just hilarious. Though I could have done without seeing Schwarzenegger shirtless in every other scene. Be careful...that is The Governator you are talking about! A friend and her mother were kind of..obsessed with Arnold. They would go see any movie if he was in it. I've enjoyed his movies, but I don't care if I see him shirtless or not. Oh please.. The Governator is getting old now... I not worried in the least! Was this the one with Kelly Preston? She was angelic in the film. Larry's rendition of "Pop Goes The Weasal" transform Curly from a harmless cream puff into a vicious contender, but when Larry’s violin breaks, it threatens Curly's boxing career with a TKO. Well the first Three Stooges short I watched had Curly in the wrestling ring... so why not watch when him in the boxing ring? That guy has all kinds of things setting him off. In the first short it was the smell of a certain perfume. And in this one it is Larry playing Pop Goes the Weasel on his violin. this is a very good short. I liked this one a little more then the wrestling short. Jim Carrey (Ace Ventura: Pet Detective, Dumb and Dumber) stars as mild-mannered bank clerk Stanley Ipkiss, who discovers a mysterious ancient mask that brings his innermost desires to wild, screaming life! Now, together with his sidekick Milo, this wise-cracking green tornado is taking Edge City over the top in this romantic-action-comedy that will leave you S-s-s-s-smokin'! 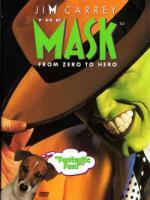 This is one of Jim Carrey's more silly movies. One I enjoy but not as much of many of his others. It is a really cartoon-ish movie... but it is of course meant to be. It is a fun movie... but one that cable used to show non-stop. And I think the over exposure to the movie took away from it a little for me. It is something I can watch every once in a great while. But not never often at all. Of course I think Jim Carrey was perfect for the role. 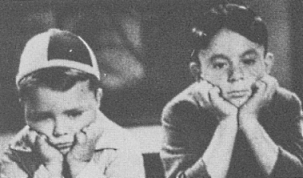 As usual, Spanky and Alfalfa want no part of school. But when Miss Lawrence catches on to their fake toothache scheme, the boys get a nasty taste of their own medicine. After the first Little Rascals short I watched Roger told me about a similar storyline but involving the group of kids that I remember the best. Said I should check it out. When I spotted it on one of the discs I have I had to pop it in. While it was good to see the characters I was familiar with again. I didn't care as much for this short as I did the previous one with Jackie Cooper. I did still enjoy the short though. I partially blame Alfalfa's singing voice for this. The quality of this short was very good. Not the best... but no real problems either. I felt like something a little more light hearted next. So thought I would watch this TV Movie that originally aired on Showtime... and started the series of the same name. The first thing you notice when watching this movie is that it has different actresses playing the aunts then what the series has. After watching the series for years this was a little on the weird side. Then there was this one young guy (playing Seth) that looked familiar to me... but I just couldn't place it. So after the movie I found out why... it was a very young Ryan Reynolds. Over-all I enjoyed the movie... was a lot of fun... and it kinda put me in the mood for the series again. So far I have the first 5 season of the series... with only 2 more seasons to go. Which will hopefully come out before too much longer. No complaints quality wise on this movie... looks as good as it did when it first aired. But I do have to complain when it comes to extras... because there was none what so ever... not even the trailer! EDIT: Note to Jimmy... I already have a review for this up. No need to add it to the list. Traveling salesmen The Three Stooges meet their toughest customers when an inventor hires them to guard his spooky home while he is away. Things get really grim when three spies diguised as monsters show up. This is the first short I watched that I don't remember at least part of. Maybe it is one I missed ever seeing... but I probably just completely forgot about it. It was a really good one though. My favorite that I have watched so far. If there is anything I didn't care for in this short it would be the all they mysterious pie throwing. It just didn't feel like it fit in with the rest of the story. Especially with them leaving it open and not letting us know who was throwing the pies. Teenager Johnny Dingle will do anything to keep his date with the hottest girl in school - even come back from the grave! You see, Johnny had the perfect scheme to win the heart of Missy McCloud, the town beauty. Unfortunately, Johnny's scam goes sour and he winds up dead! Even so, Johnny's determined to keep his date - unaware of the hilarity waiting for him upon his return! See for yourself why everyone's dying to see this outlandishly funny comedy! Hmmmm... what is it that I think about this movie. On one hand it is a fun little Romantic comedy horror. It has an enjoyable story and they do some fun things with the fact that he is a zombie. Like when he is making out with his girl in the care she starts to nibble on his ear and his ear falls off. Being a zombie movie they had to put some gore into it. which of course is done more in a comedic way... and really don't look that real or anything. On the other hand there is a lot of over-acting... and I really didn't care for the comic book inserts into the movie. Not to mention some of the stuff in the movie was just plain silly. I am happy I added it to my collection. But it isn't one I would really watch that often.